The Royal Mail have no recollection of how a red postbox suddenly appeared in the middle of one of the buttresses of a Berkshire river bridge overnight two months ago. Many theories have been voiced, some believing a ghost of a girl who has been seen many times by locals is behind the mystery, others believe that the postbox is part of a promotional stunt of the Mikron Theatre company for a play. We provide a large variety of different coloured and style postboxes, with our traditional postbox range remaining popular for both period and modern properties. We even provide an easy to use create your own custom coloured letterbox service. 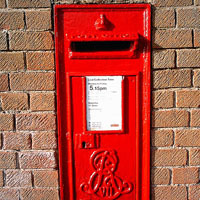 The village postman and canal users had not noticed the postbox before and following many struggled attempts at posting letters, it is not an operational posting facility. Positioned only a few feet above water level it will regularly flood.